Dr.Girish Gupta, recipient of many national and international awards, also a member of Central council for Research in Homoeopathy had contributed many cases with evidence-based documentations. Here we give a case of adenomatous goitre presented by him. He has a scientific approach with determination to do “Something Significant” and redefine Homoeopathy on modern scientific lines. This case has been treated recently and he shares his experience with all. A forty nine year old male patient presented a hard swelling in the anterior aspect of neck since 9 months. The swelling gradually increased in size and pressure effect made swallowing process very difficult. He had Pain and stiffness of nape of neck and right shoulder radiating to right upper limb with cracking sound neck. 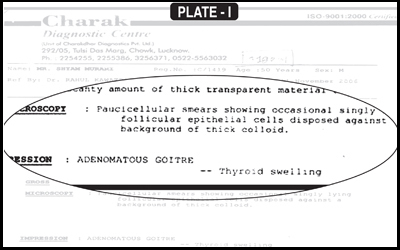 The patient was already investigated at Department of Radio diagnosis, King George Medical University, Lucknow and was diagnosed of having Adenomatous Thyroid Nodule. Patient narrated of being in stress and remained in grief when he lost his mother and sister–in–law within 15 days two years back. He had homoeopathic cervical spondylosis one year back without relief. Blood pressure: 110/78 mm of Hg. Hard nodular swelling anterior aspect of neck, dysphagia reduced. Pain and stiffness nape of neck and right shoulder remained as such. No further reduction in hard nodular swelling anterior aspect of neck and dysphagia. Pain and stiffness nape of neck and right shoulder remained as such. Hard nodular swelling anterior aspect of neck markedly reduced. No dysphagia was reported by the patient. Pain and stiffness nape of neck and right shoulder much reduced. 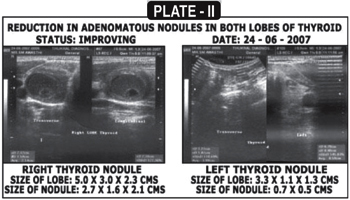 The hard nodular swelling anterior aspect of neck markedly reduced as evident from the photograph although the ultrasonography of neck revealed some remnants of Adenomatous goitre in the thyroid after 4 months of homoeopathic treatment. The patient was advised to return for regular follow up till complete remission is evident in the ultrasonography.